Although I fished on New Year's Day I couldn't be bothered blogging a repeat of New Year's Eve. Two weeks of rod building later and I was going round the twist. So, despite rain, I headed for the river. Amazingly by the time I got there the rain had stopped, the sun was shining, the wind light and the river looked spot on. Carrying two feet or more of coloured water and a warmer temperature than it had been for the majority of my last few visits. I settled in to a nice slack and relaxed. I spent the next hour watching a kingfisher on the far bank. Diving from both a perch and the hover. Then I noticed something odd. The slack was more of a boiling cauldron and the grass was disappearing under water. I moved to a larger slack with a cracking crease that had to have a barbel or two in residence, and pushed a stick on the water line. Within minutes the stick was starting to disappear. I gave it an hour and moved again. The next swim also had a decent sized slack area, but the crease was more turbulent. I stuck it out for about three hours, watching the water rise and force me back up the bank while large branch shaped silhouettes drifted down stream at an alarming rate in the dark, before another move. This final swim I fished usually involves a three foot drop to a ledge when a fish has to be landed. That wouldn't have been required last night! By seven o'clock I'd had enough. Conditions were good in some respects - air and water temperature, and clarity - but the physical aspects of being able to keep a bait in the places you wanted was a chore. Leaves and other debris being the main problem. As I left for home the rain was falling again. Only lightly, but it was still falling. The big problem with river fishing in winter is timing. 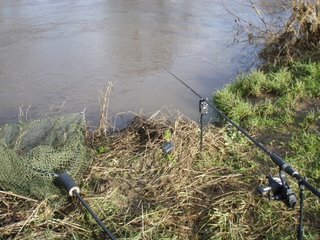 And I'd got it slightly out - a day earlier and the river wouldn't have been rising so fast and would have been more fishable. If the river is on your doorstep it's much easier to get the timing right, but when travelling is required it's not so easy to nip down for a couple of hours, pack up if it's not spot on and return a day or two later when it is.